The Chesterfield Post has previously reported on the appearance of a Falcon and a Puppy in the centre of Chesterfield HERE. 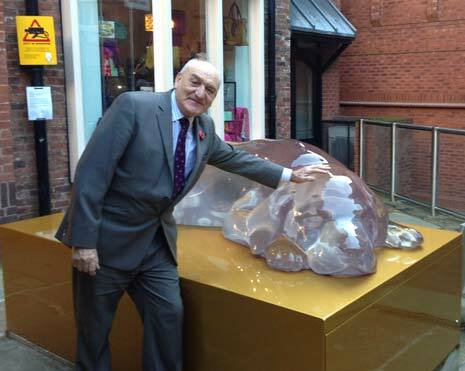 The sculptures, designed by Geoff Wood, were created as part of an initiative to promote local businesses and attract shoppers. Today, they were officially unveiled by the Mayor and Mayoress of Chesterfield and Leader of Chesterfield Borough Council, Cllr John Burrows (pictured below). Sculptor Geoff told us that he was honoured to have been chosen and also revealed a history of Chesterfield not many know, "The puppy came about as we wanted to attract people into this place - there's a lovely sequence of alleys and places in here, but not enough people are aware of them. We wanted to bring some elements of history to life a little. "The idea for the puppy came from the fact that, historically, this area was called the 'Dog Kennels' as they were back to back here and people were working on top of each other - and that was a colloquial term that people used. We wanted to turn that on its head and create a positive image - rebirth and regeneration - so the idea of a puppy came about, something emerging rather than a full grown dog. "We wanted something to be gobsmacking - something that would make people go 'wow' and I wanted it to be incredibly accurate so you could feel it and believe it. We wanted a material that would glow at night so that when people were here at night, it would make them feel welcome. "The material is an acrylic resin so it's crystal clear, but it catches all the light around it so it's impossible to work out what's going on. As you move, the light moves and it's a magnet for light. "This place is tightly built and it's quite dark in here, so we wanted something that would capture that light and transmit it, something that people that people want to touch and feel. "It took a year to make but there were other factors; planning and various design options until we got the process underway." 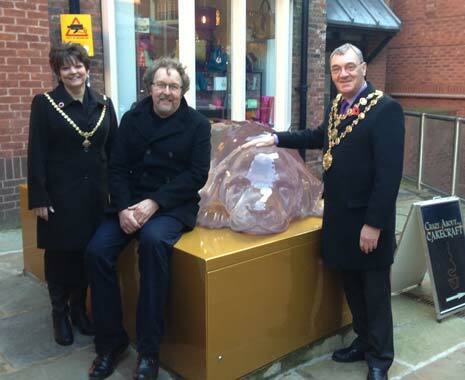 In his speech the Mayor, Cllr Donald Parsons (above right with the Mayoress and Designer Geoff Wood) said, "I am delighted to welcome you here today to celebrate the arrival of some new art installations into The Yards. "As you know, the Yards is an area filled with unique and interesting speciality shops, cafes and restaurants and is a very important part of the overall offer of Chesterfield to residents and visitors alike. It is important to us that the businesses in this special area flourish so that it can continue to be Chesterfield's 'hidden gem'. 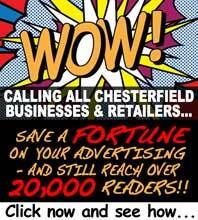 "With this in mind, Chesterfield Borough Council have been working with traders over the last two years to look at ways in which we can promote the area and encourage footfall. "Chesterfield Borough Council has secured £250,000 grant funding from the European Regional Development Fund to enable us to undertake a programme of public art work and signage improvements, to help entice people to visit the businesses in the area and spend more time shopping and enjoying the lovely eateries. No additional Council funding has been used to install these wonderful pieces of art. "The project has been managed by Geoff Wood of Working pArts who has worked with the local traders and the Council to develop the ideas and proposals for the art works and signage that you see today. "I would formally like to invite you all to enter a competition which has been inspired by children that have already visited the puppy and been overheard asking what its name is. "The traders have got together to offer a prize for naming the puppy. The local press will be promoting this competition and we hope that as many people as possible will enter. Please help yourself to an entry form which can be posted in boxes at various locations within The Yards. "The traders will choose a name and inform the winner. The winning name will also be announced in the local press. "We hope you will enjoy the new art installations and continue to support the businesses here in The Yards." To enter the competition to name the puppy, run by Chesterfield Borough Council and with prizes donated by local businesses in The Yards, get yourself an entry form from any of Altered Chic, M's Gallery, No 10 Tearoom, Chesterfield Beadshop, Crazy About Cakecraft and The Gift Horse. The closing date for entries is Sunday December 2nd.